"Come on, Robin, to the Bat Cave!" LED lights bring the statue to life! Measures about 18-inches long and weighs 20 pounds. From the creative minds at Factory Entertainment, comes the Batman 1966 TV Series Batcave Desktop Sculpture Statue. The statue features 16 different LED lights in a variety of hues that bring the Batcave to life. The statue has been meticulously hand-painted with period correct colors that were thoroughly researched and includes scaled replicas of the most important signage and graphics. 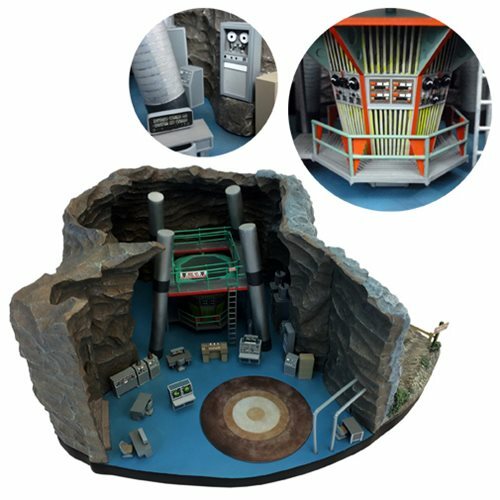 This model is not a static statue and features a host of moving parts like the turntable that can be manually rotated and selected movable furniture that allows you to dress the Batcave as you prefer. Made of polystone, ABS, and metal, This 20-pound statue measures about 18-inches long x 14-inches wide x 9-inches tall. Requires 4x "AA" batteries, not included.